The global stretch and shrink films market was valued at US$14.1 bn in 2015 and is projected to reach US$21.1 bn by 2024. The sales revenue is expected to rise at a CAGR of 5.2% during the forecast period, owing to the increased demand for packaged foods and beverages. Over the last few years, the industry has witnessed the emergence of multiple players operating globally. However, Transparency Market Research has found that there is an increasing shift in dynamics towards market consolidation. By product type, the stretch and shrink films market is led by shrink films and the segment is estimated to be most preferred product type throughout the forecast period owing to the rising applications of light-weight packaging films. The low density polyethylene (LDPE) material segment is the leading contributor to the growth of stretch and shrink films market. However, it is projected to lose significant market share to other materials such as PVC, linear low density polyethylene (LLDPE), and polypropylene. Based on end use, the food and beverages sector leads the stretch and shrink films market but is expected to lose market share by the end of the forecast period owing to the mature nature of the industry when it comes to the use of stretch and shrink films. On the basis of geography, the global stretch and shrink films market is segmented into North America, Europe, Asia Pacific, Latin America, and the Middle East and Africa (MEA). Asia Pacific is expected to lead the market throughout the forecast period and also register the fastest growth. 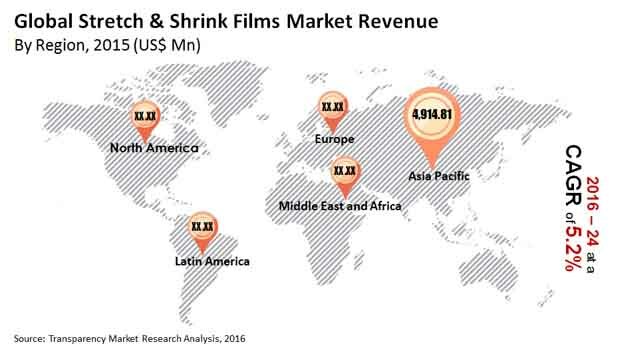 The stretch and shrink films markets in North America and Europe are rather mature and are expected to lose a significant share of the global market to Asia Pacific. Asia Pacific offers new opportunities for players engaged in manufacturing stretch and shrink films as the region has been witnessing an increase in investments in the manufacturing sector, rapid pace of urbanization, and rising disposal income. Key players operating in developed stretch and shrink films markets such as North America and Europe are focusing on APAC in order to multiply their revenue by optimally utilizing the cheap resources available in India and several ASEAN countries. Europe is expected to witness sluggish growth over the forecast period. Nevertheless, Germany and France are expected to continue contributing to the overall sales of stretch and shrink films in the region. The presence of organized retail outlets in the region is the key factor driving sales in Europe. In MEA, the sales of stretch and shrink films are expected to witness moderate growth during the forecast period, with most of the demand stemming from GCC countries. Key participants in the stretch and shrink film market include Anchor Packaging, Berry Plastics, AEP Industries Inc., Bemis Company Inc., Dow Chemical Company, E. I. du Pont de Nemours and Co (DuPont), FUJI Seal International Inc, and Intertape Polymer Group Inc. This Transparency Market Research Report examines the ‘Stretch and Shrink Films Market for the period 2016-2026. The primary objective of the report is to offer updates and market opportunities in the global stretch and shrink films market. Stretch films are stretchable plastic films that are commonly used for packaging bulk items by wrapping around palletized loads together. Due to its tough and strong characteristics, stretch packaging is used in transportation and storage applications. Shrink films find wide usage in packaging of food items and other consumer goods. Commonly used in retail stores to pack a single product or a cluster of smaller products together. To understand and assess the opportunities in this market, the report is categorically split under four sections namely: market analysis by product, material type, end use and region. The report analyses the global stretch and shrink films market in terms of market value (US$ Mn) and market volume (units). The report starts with an overview of stretch and shrink films and its usage in various applications across the globe. In the same section, TMR covers the stretch and shrink films market performance in terms of revenue. This section includes, TMR’s analyses of key trends, drivers and restraints from supply and demand perspective. To arrive at the market size, the report considers average price of stretch and shrink films per metric ton across geographies. The forecast presented here assesses the total revenue of stretch and shrink films. When developing the forecast of the market, the starting point is sizing the current market, which forms the basis for the forecast of how the market is anticipated to take shape in the near future. Given the characteristics of market, we triangulated the outcome based on different analysis based on supply side, demand side and consumer and retail index. However, quantifying the market across aforementioned segments and regions is more a matter of quantifying expectations and identifying opportunities rather than rationalizing them after the forecast has been completed. In addition, we have taken into consideration year on year growth to understand the predictability of the market and to identify the right opportunities across the stretch and shrink films market. As previously highlighted, the market for stretch and shrink films is split into various categories based on region, products, materials, end-use segments. All these sub segments or categories have been analyzed in terms of basis point share (BPS) to understand individual segments relative contribution to growth. This detailed level of information is important for identification of many key trends in stretch and shrink films market. Also, another key feature of this report is the analysis of stretch and shrink films market by regions, products, end-use segments and materials and its revenue forecast in terms of absolute dollar. This is usually overlooked while forecasting the market. However, absolute dollar opportunity is critical in assessing the level of opportunity that a provider can look to achieve, as well as to identify potential resources from a sales perspective in the global stretch and shrink films market. Furthermore, Transparency Market Research has developed market attractiveness index for all four segments-regional, product type, material type and by end-use segments. This index helps in identifying the real opportunities that lies in the market.